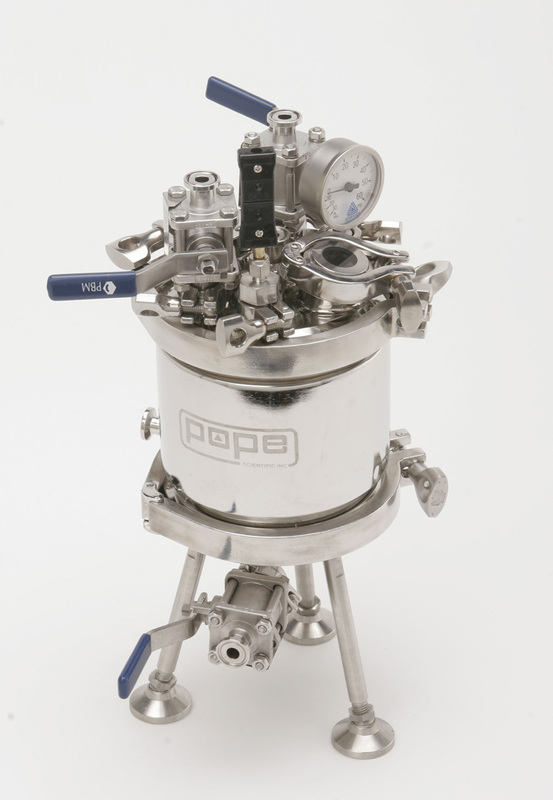 Pope Scientific has been designing and manufacturing distillation and filtration equipment for Labs, Pilot Plants, & Production Processing worldwide for over 50 years. Pope’s short path/wiped film stills, evaporators, molecular stills, fractional distillation columns and Nutsche filter dryers can be found working in R&D laboratories, universities, small & large corporations throughout the world. Pope Scientific Short Path/Wiped-Film Stills (WFS) and Wiped-Film Evaporators (WFE) successfully separate volatile from less volatile components for Oils, Fats, Chemicals, Polymers, Nutraceuticals and Fragrances etc. with a gentle process utilizing the thin-film wiping action of feed liquid through a heated cylindrical vacuum chamber with high vacuum (i.e. vacuum distillation/evaporation). The brief (seconds) exposure of feed liquid to heated walls is due in part to the slotted wiper design which forces the liquid downward with strict control of residence time, film thickness, and flow characteristics. Efficient thermal separation with minimum product decomposition and maximum product quality result when using the Wiped Film-Short Path process for distillation. The Wiped Film process offers far superior performance to flash evaporators, falling film stills, rotary evaporators and similar equipment in any processing application where heat-sensitivity is a factor. Wiped-Film still technology takes advantage of the fact that each chemical substance has a characteristic vapour pressure. It is this relative difference in vapour pressures which dictates how easily a complex compound can be separated into its constituent components. Since the molecules of all matter are in constant motion in varying degrees, depending upon the chemical composition of that matter and the temperature and pressure applied to it, molecules near the surface have a tendency to escape into the surrounding atmosphere. As temperature increases and pressure decreases, this escaping tendency usually increases and the substance is said to vaporize. The force generated by these escaping molecules is refer red to as the vapour pressure of that material at a particular temperature and pressure. It is the relative difference in vapour pressure of substances which dictates how easily a complex compound can be separated into its constituent compounds. The Pope Wiped-Film Still consists of a heated body into which a fluid system requiring some degree of separation is continuously fed. The fluid is spread into a thin film by a rotating wiper blade assembly driven at a predetermined speed. The film, while being forced into turbulent flow by the wiper blades, progresses down the inside body wall aided by gravity and the slots in the wiper blades. 1. Turbulence created by a rapidly moving wiper or controlled clearance blade greatly assists in heat transmission, thereby lowering the temperature required on the inside evaporator wall for a given system pressure. 2. A maximum surface area per unit volume of flow is generated facilitating rapid evaporation. 3. The liquid exposure time to the elevated wall temperature can be controlled within seconds or less. This minimizes product degradation of heat sensitive materials by controlling the wiper assembly speed. 5. Pope slotted wiper blades promote plug flow /with little back mixing. This minimizes dwell time distribution ensuring that material flowing through the system has a uniform exposure to process conditions. Pope adds superior design and construction to the basic wiped-film still process. This has enabled Pope stills to sustain pressures down to one micron for either solvent stripping or molecular distillation. Pope variable speed control of the wipers coupled with the ability to reverse rotation, allows an extremely wide variation of hold- up time for the process fluids in the evaporator body. Pope supplies either Teflon or carbon wiper blades with carbon preferred on applications with temperatures over 200 degrees Centigrade. When increased condensing capacity of a non- corrosive distillate is required, the conventional glass “cold finger” can be replaced by a stainless-steel condenser presenting a unique combination of Pope process capabilities. It is the ability of Pope craftsmen to work in both glass and stainless steel and combinations of both that provides a unique dimension of excellence — a combination of process variables not available elsewhere. Pope Scientific offers you flexibility! In those instances when corrosiveness to stainless steel is a problem, Hastelloy, Titanium, C-20, other alloys, or glass can be offered as the preferred construction materials. 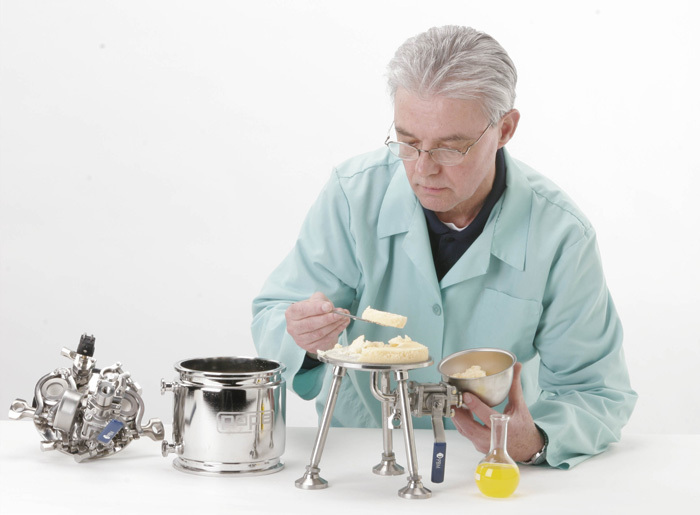 Pope Scientific observes the most stringent quality control. To generate sound research and development data for molecular distillation or solvent stripping process, variables must be rigorously controlled — i.e. feed rate, wiper revolution rate, still body temperature and pressure. Pope Scientific provides the capability to control each of these variables to the degree required for efficient and repeatable processing. 1. 2” model with a 323 sq. cm. (.35 sq. ft.) evaporator surface. 2. 4” model with a 1,097 sq. cm. (1.18 sq. ft.) evaporator surface. 3. 6” model with a 2,194 sq. cm. (2.36 sq. ft.) evaporator surface. Model size is based on the diameter of the evaporating chamber. Still components are normally made from borosilicate glass except for the drive system (usually 316 stainless steel) and wiper blades (Teflon™ or ultra-pure high temperature carbon). Other materials are furnished on special order– such as stainless steel or quartz in place of glass and other metals substituted for the drive. 1. Larger feed and receiver flasks. 2. Extra condensing power, as supplied by Pope external condensers, or stainless steel internal condensers, rather than the glass internal condenser. 3. Higher heating capacity, as affected by metal band heaters, heat transfer fluids or stainless steel bodies. A basic system for concentration/evaporation will include the wiper drive, wiper blades, evaporator body with internal condenser, feed and degasser flask, receiver flasks, external condenser and receiver flask, adapter from condenser to vacuum and the vacuum system. The type of heating system and temperature control will depend upon such factors as maximum body temperature, desired throughput, etc. “Temperature Control Systems.” Additional components, such as a liquid nitrogen cold trap, various instruments, etc., can also be supplied. In molecular distillation, the desired final product is usually the distillate. Pope Still bodies are dimensionally designed for more efficient molecular distillation. The condenser is situated inside the evaporator, with its condensing surface sufficiently close to the evaporating surface so as to minimize collisions of evaporated molecules on their path from evaporator to the condenser. 1. High vacuum systems (see Pope Bulletin No. 6, “Vacuum Systems”). 2. More precise temperature control (see Pope Bulletin No. 4, “Temperature Control Systems”). A basic system for molecular distillation will include the wiper drive, wiper blades, evaporator body with internal condenser, feed and degasser flask, receiver flasks, liquid nitrogen cold trap and the vacuum system. The type of heating system and temperature control utilized will depend upon such factors as maximum body temperature, desired throughput etc. Additional components, such as instruments, can also be added. Solvent stripping is essentially the same type of separation as concentration/evaporation. The desired product is usually the residue (bottoms). The distillate (the removed solvent) is generally sufficiently pure enough to be reused. Because the latent heat of vaporization for solvents is typically, 1/4 to 1/6 that of water (which is usually removed in the evaporation/concentration mode), throughputs are considerably higher. Feed pumps are often used to pump the feedstock out of large feed vessels. Thus, a run of many hours can be performed without any operator assistance necessary on Pope automated systems. Note that the largest throughputs are obtained with the stainless bodies using an external condenser. 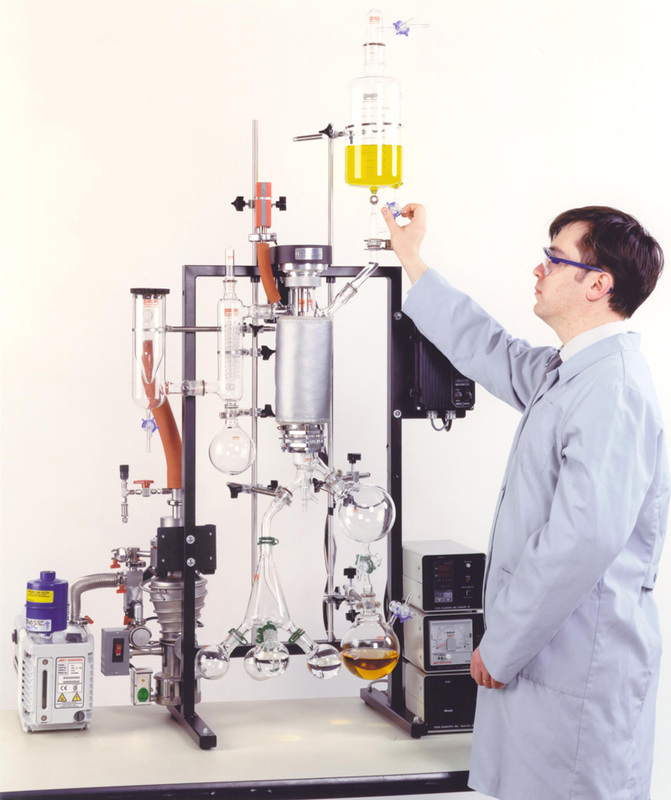 A representative system for solvent stripping will include the wiper drive, wiper blades, evaporator body with stainless steel internal condenser, large feed flask with feed pump, receiver flasks sized to accommodate desired throughput, external condenser with receiver flask, adapter from external condenser to vacuum system and the vacuum system. As in all cases, the type of heating system and temperature control will depend upon such factors as maximum body temperature, desired throughput, etc. Pope Nutsche Filter-Dryers are used world-wide for critical high purity separations of liquids and solids. Products include pharmaceuticals, bio-materials, electronics grade materials, fine speciality chemicals, and many others. Nutsches are available in laboratory, pilot plant and production scale, in volumes from 0.2 – 1000 litres and Pope’s smaller lab scale Nutsche units provide chemists and researchers with a very powerful tool for testing, piloting and small scale processing. These are a logical leap forward from common Buchner funnel apparatus. Standard Benchtop Nutsches are available in 6” diameter, with choice of 3, 4 or 5 litre volumes and are kept in stock for short delivery times. ASME stamped, (other certifications available), and pre-fitted with useful components including valves, sight glasses, pressure relief, spray assembly and pressure/vacuum gauge, the user can select optional jacketing or electric heating and optional choices of either motorized mixer or else up/down cake agitator in manual or motorized versions. Further information is available in our Benchtop Flyer. Custom Benchtop Nutsches are also offered in sizes as small as 3” diameter, volumes as small as 0.2 litres. Extent of componentry depends on size and other considerations. Larger units than the Standard Benchtop Nutsche are also available, though these 8” and larger diameters and weight of these brings them more into the domain of floor standing pilot category rather than Benchtop category. In addition, Custom Benchtop Nutsches can be designed for various requirements, including such features as custom stands, funnel heads, instrumentation, heating/cooling circulators, alternate alloys and coatings, pumps, or other customization. Larger Nutsches are available in volumes including 10, 20, 30, 40, 50, 100, 200, and up to 1000 litres, plus any special volumes in between. “Typical” type units are offered providing a similar feature set as the Pope Benchtop series, but in addition, several design choices plus a very broad range of unique customization are available. 316L stainless steel construction is standard, other alloys, coatings and special finishes are available. ASME certification is standard, CE/PED and others also available. Sanitary clamp type flanges can be utilized in even sizes up to 12” diameter vessels. The lower flange is a special variation which allows for holding and sealing a variety of filter screens and fabrics. Upper removable lids and flanges are available also. Beyond 12” diameters, heavy duty flanges and C-clamps are utilized. The most basic vessel geometry is a single lower flange only. With this design, the entire body is raised up, or the bottom end is lowered from the body to harvest the filter cake. Another option is to also have a removable top head. This provides the user with two means of access and harvesting, removing either the top or the bottom head, or both. Some users prefer to have an additional flange for vessel break-apart a short distance or midway up from the bottom filter flange. This provides for containing of the filter cake when the upper section of the vessel is removed, and convenient cake harvesting without spillage. There are other variations including “removable basket” design. See photos for examples. Nutsche vessels normally come with legs with locking castors. Depending on geometry, (see above) the number and location of legs may vary. With vessels larger than 8” diameter, the vessel sections can become heavy and inconvenient for manual movement and lifts are typically provided for safe raising/lowering and movement across rooms. Variations can include self-contained lifts, platforms, and specialized frame for manual or automated rotation of vessel. See photos for examples. In many cases, though not all, some means of agitation is required or preferred. Pope’s Series 700, 800 or 900 mixers are offered for conventional type stirring of slurry before or during filtration or after reslurrying. Raising/Lowering cake churning and smoothing agitators are also offered. These provide greater efficiency in braking up clumps and shortening drying time. Vessel jacket heating is offered to help in drying the filter cake. Heated dry air or nitrogen can also be admitted at a fixed rate. These, in conjunction with vacuum and cake agitators optimize drying efficiency. Electric heaters are available as an alternate to liquid jackets. Multi layers stainless steel filter screens are available from 1 to 200 micron pore size. 50 micron filter are “standard”, covering a wide range of applications. In addition, polypropylene cloth and other special type membrane filters can be used. Pope’s designs provide customers with a choice and changing from one type to another without any further Nutsche unit modification. Many options are offered including sight glasses, valving, pressure and temperature indication/control, other sensors, sampling ports, spray head, and side discharge harvesting ports. Special skid mounted systems combining liquid and vacuum pumps, reactors, control systems and other turnkey features are also available.